Join Arundel Athletic Boosters Today! The Arundel Athletic Boosters is a service-driven organization focused on supporting the Arundel Athletic Department, the student athletes at Arundel High School, parents, coaches, Arundel High School administration, as well as the rest of the students at Arundel, teachers and the Gambrills/Odenton community. For $25 per year, your family can have a membership for the Arundel Athletic Boosters. Please consider joining the Arundel Athletic Boosters. Without your contribution, we aren’t able to provide our student athletes, teams and athletic department with the above items. If you are paying by PayPal, please be sure to include your address so we can mail your membership card. Provide Senior Banners to each senior student athlete for all varsity and unified sports. Since beginning program in 2017, Boosters has organized and delivered senior banners for senior nights to more than 600 student athletes, saving parents more than $30,000 over the course of two school years with our ability to buy in bulk and negotiate substantially better pricing! Present teams with concession fundraising opportunities (through special tournaments) totally more than $5,000 back to team funds during the 2017-2018 school year. Purchased football team necessary equipment improvement of a 32 ft. trap chute ($2,600) – July 2018. Provided necessary funding to complete Carroll Field scoreboard upgrade ($6,000) – August 2018. 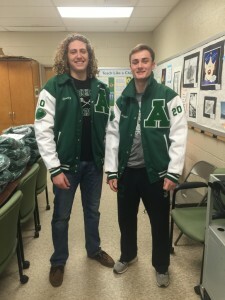 Work with athletic department to design and bring back letter jacket tradition to Arundel High School and organized sale; and much more! Provide news and information, photos and scores via Facebook, Twitter and Instagram.